As the newest writer for FishDuck, I would like to take this opportunity to thank the staff and all of those involved with this tremendous resource for allowing me to share my knowledge of my Oregon Ducks through the medium of writing. Please refer to the writer’s biography at the foot of this report for a quick summary of my background. Now down to business. At this time, I will be posting a weekly update/recap of all things that involve Oregon recruiting (not just limited to football) on Wednesdays. Accompanying weekly installments of “Recruiting Recaps”, I hope to also compose pieces that highlight Oregon Ducks teams not readily covered in the media (i.e. lacrosse, women’s soccer, and so forth). Thanks for reading! With national signing day (Feb. 1) just around the corner, the Ducks find themselves with a solid stack of football recruits. As of Tuesday (11/17), Oregon boasts 19 commits in this year’s football class, headlined by running back Byron Marshall (San Jose, California/four star), defensive end DeForest Buckner (Honolulu, Hawaii/four-star), and wide receiver Dwayne Stanford II (Cincinnati, Ohio/four star). For a complete list of Oregon commits, please click here. Looking over the list of prep players headed to Eugene, I can’t help but remember a time when Oregon would have been overjoyed to land even one of the recruits that is considered “mid-level” in its current batch of newest commits. Oregon is no longer the fourth or fifth school on the lists of the nation’s top high school players. While Oregon might not snag 10 five-star “rated” commits, the Ducks have generated enough publicity from on-field performance to create mass-appeal to a wide range of athletes with different backgrounds and talent sets from across the country. Simply put, Coach Kelly’s “WIN THE DAY” mantra and Uncle Phil’s diligence to turn Oregon into the premier athletic institution in the country is reaping great rewards. Oregon now competes head-to-head on a national scale with every other program, even the traditional super-powers. Over the next couple of weeks, Oregon will be making its final push for targeted hold-outs to fill the last few remaining slots of the class. Schools are permitted to sign up to 25 athletes each year, though there are clauses that permit teams to exceed that number with some tricky math from early-enrollees, transfers, and greyshirts. This past weekend, four-star recruit Thomas Johnson made his official visit to Oregon. The 6’0, 180lb receiver out of Skyline High in Dallas, TX de-committed from his original program choice, Texas, and opted to test the waters of Oregon. Johnson’s 4.4 speed could add play-making ability to an already heralded class of skill position players and a group of speedsters from last year’s recruiting class that redshirted (Tacoi Sumler, Devon Blackmon, B.J. Kelley). Only time will tell whether Johnson decides to become a Duck, but the fact that he opted out of an offer from a storied home-state program and made his way to Eugene is very encouraging as programs scramble to fill their open roster slots. Oregon will look to bolster a speed-laden class with upcoming visits from wide-outs Jaydon Mickens (Los Angeles, CA/four star), Bralon Addison (Missouri City, TX/four-star), Javon Williams (Chandler, AZ/four-star), and Julian Brooks (Chatsworth, CA/three-star). While there is absolutely no way that every single one of these prep stars will dawn Lighting Yellow and Thunder Green together, the heavy recruitment of wide receivers illustrates the commitment by Duck coaches to improve the receiver squad for the passing game with an emphasis on speed. Coupled with returners Josh Huff and Rahsaan Vaughn alongside redshirts Devon Blackmon, B.J. Kelley, and Tacoi Sumler, the 2012-13 Ducks receiver corps might be one of the most complete in program history depending on how quickly Blackmon, Kelley, Sumler adjust to game speed. With a large amount of uncertainty in regards to last-minute visits and the inevitable changes of heart that will come as the clock ticks down to signing day, I will instead highlight a post-season honor bestowed upon a member of Oregon’s recruit class. This past week, Duck commit Oshay Dunmore was named a Parade All-American as an “All-Purpose Player.” The 6’2, 195lb. athlete from Newport High School will most likely patrol center field as a safety. 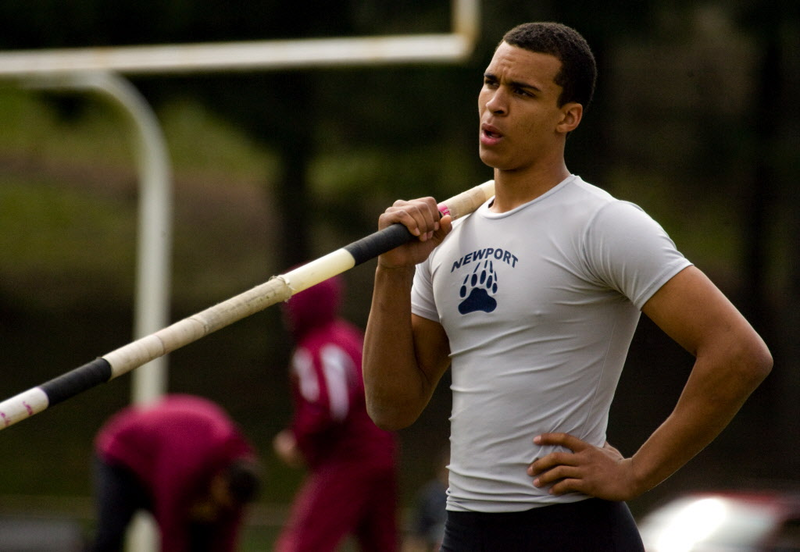 Dunmore is also a decorated decathlete and by all accounts will suit up for Coach Vin Lananna’s vaunted track squad. Switching from Autzen to Knight Arena, it’s become obvious that Dana Altman’s hardwood crew needs a refined inside presence to supplement perimeter play. Look no further than five-star prep superfreak Anthony Bennett hailing from Las Vegas, NV. The 6’8, 230lb. forward has narrowed his almost endless program offer list to five, with Oregon very much alive and well in the mix. Heading into the spring, the Ducks boast a trump card in the race to sign the athletic Canadian-born bruiser. Bennett’s high school point guard, Dominic Artis, a four-star recruit in his own right has already committed to the Ducks, thereby creating the rare chance for two players instrumental in the other’s prep career to dawn matching uniforms at the collegiate level as well, in Oregon’s case, Green, Yellow, Black, Grey, the list goes on…uniforms. The Finlay Prep duo could be a staple of Ducks Basketball for years to come if Altman and his staff can pull this recruiting dream into reality. Look for another Recruiting Recap next week! WTD!! !